Hospice is compassionate care for terminally ill patients and their families. Live your last months, weeks and days to the fullest, enjoying peace and dignity in your own home. Hospice is a team approach to enhancing quality of life, managing pain and allowing you to make the most of time with family. Hospice also helps survivors when precious time with a loved one has come to a close. Hospice care is available to any person whose life expectancy is measured in terms of months. It is sometimes difficult to determine life expectancy, but Hospice is a good option whenever other treatment has been exhausted. Hospice is NOT about giving up, but rather focuses on quality of life and making the most of a patient's remaining time. Thanks to Hospice caregivers, patients and families can enjoy their time together while leaving the medical care to professionals. 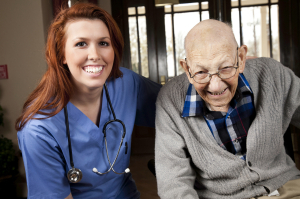 Hospice caregivers can come into a private home, nursing home, or even a hospital room.